signed: "Ray Strong -- " - signed in paint, BR (see add info with regard to signature reported by Mark Humpal Fine Arts. No "72" visible on canvas in line with signature. Possiblity exists that the date is under the matted canvas. inscription: Didactic panel mounted to cardboard backing, TL:"Indian Summer / 1950 / Oil on canvas / Courtesy of the Strong Family Trust / This painting, the second of two with the same title / (original Indian Summer of 1936), was executed completely as a studio painting. This elongated version, with hard contrasts of shadow and lyricism, consciously allows the female forms to emerge. / " 'Betty's in this one'. ""92" encircled on TL of cardboard backing, written in green ink. "Owned by B. Strong" - on TL of cardboard backing, written in ink. "Indian / Summer / 10 - 15 / studio" - written in ink on paper tag attached to hanging wire. Oil painting with landscape composition depicts Black's Mountain in West Marin County, California. Tan rolling hills shaded in tones of blue and lavender are painted on the canvas sloping from lower left to upper right. Multiple trees with rounded canopy and deep green foliage line the valley between the upper hills. A few trees also appear in a group at lower right. The top left portion of the canvas shows a light sky tinted green using impasto that shifts to a thinner light blue paint application at upper right. Appraisal by Mark Humpal Fine Art, July 3, 2007 (see file) "REPORT OF FINDINGS / 1. An oil canvas by American artist Ray Stanford Strong (1905-2006) signed lower right "Ray Strong 72." The oil measures 24 inches vertically and 52 inches horizontally and appears to be in excellent condition. The painting was created circa 1972 and the title is "Indian Summer II." 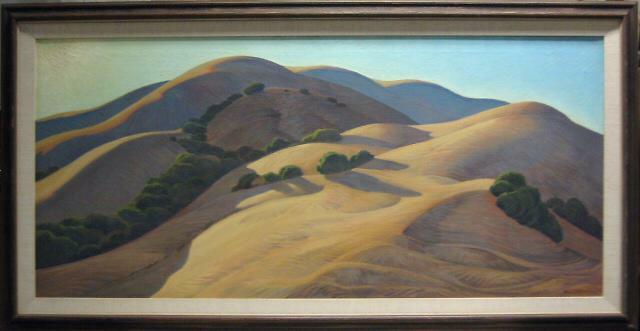 This oil painting has descended in the family of the artist and depicts Black's Mountain in West Marin County, California. It was most recently exhibited in the artist's 100 year retrospective in 2005 held at the Santa Barbara Museum of Natural History, entitled "Ray Strong: Taking in the Landscape." Clack's Mountain was perhaps Strong's favorite landscape location to paint and as such the subject is an iconic one in the artist's oeuvre. This painting was ostensibly painted, at least in part, after a circa 1936 painting by Strong entitled "Indian Summer."